For anyone who has ever wanted to take really cool 360° videos and photos, the Samsung Gear 360 (2017),* with its spherical dual-lens and easy-to-grip handle, is one of the best budget-friendly options out there. If you’re wondering why in the world someone would need a 360° camera or how the Samsung Gear 360 performs, read on to find out why it’s cool and what we learned. *Please note that this article is reviewing the Samsung Gear 360 (2017) camera, not the earlier Gear 360 model without a handle. Dimensions: 4 x 1.8 x 1.8 in. The coolest thing about the Samsung Gear 360 camera is that it takes 360° photos and videos. It uses two 180° fisheye lenses, so you end up with a full picture of everything around the camera. Compared to the original, the 2017 model more effectively stitches the photo and obscures the seam where the two 180° photos meet for overall better photos and videos. It’s ideal for outdoor adventures, exotic locations, or unique experiences where you’d want a full view of your surroundings. It can also be fun for family gatherings or other events, though it isn’t ideal for quick, everyday photography. Overall, it’s just a neat, useful gadget. 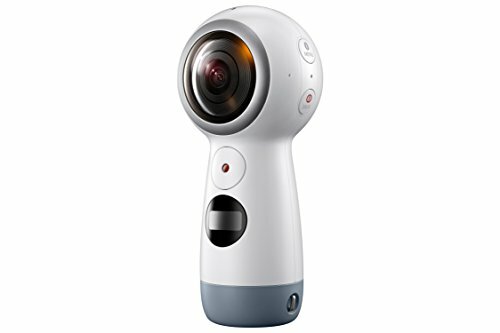 The addition of a handle makes the second generation of the Samsung Gear 360 easier to hold and operate than the previous model. Plus, the easy-to-use buttons and small screen that allows you to manually change the settings also makes the model more user-friendly. Because the 360 camera is small and lightweight, it can stand on its own or attach to a tripod or selfie stick. While the price tag may not make the Samsung Gear 360 cooler, it certainly broadens its appeal and availability. It’s more than $100 cheaper than the previous model and much less expensive than many comparable cameras. This is a big reason this camera is great for people new to shooting VR and 360° videos. Speaking of which, the next really cool thing is that you can take virtual reality (VR) videos and upload them to Samsung’s VR platform. In fact, the Gear 360 is meant to be used with the Samsung Gear VR, so if taking and sharing VR videos is what interests you, using those two products is a great way to start doing that. Whether you’re shooting a VR video or a standard one, the Samsung Gear 360 shines in video mode. The big selling point is that it can record a 360° video in 4K resolution (4096 x 2048) at 24 frames per second (fps). However, this is not the most efficient setting for your camera—recording in 4K will take up more space on your SD card and drain the camera’s (and your smartphone’s) batteries more quickly. Videos in 4K can also take much longer to upload on your phone, especially on older or iOS phones. Beyond the 4K capabilities, the 360 also has many recording customization options, including the resolution and recording speed, which will affect the maximum recording time available. For example, you can record with a single lens at a lower resolution (1920 x 1080) but at a faster speed (60fps) for up to 180 minutes. Or if you want a 360° video not in 4K, you can record at 30fps and a resolution of 2560 x 1280 for up to 130 minutes. We love to see multiple options for maximum usability, and the Gear 360 provides that. Another cool factor for the Samsung Gear 360 is that you can stream your videos live to the platform of your choice—and even better, it’s simple to do. You just pair the camera with your smartphone or PC, choose a platform to stream to, and you’re ready to go. Because a 4K video file is huge, the resolution of a live broadcast is much lower than 4K (1920 x 960). You can only use this feature with specific Samsung phones with the latest Android software. To make the most of the camera, you need to connect it to a compatible smartphone and download the mobile app (available for Android and iOS) or a computer with PC software and download the 360 ActionDirector software. With those tools you can edit, stitch together, and share your photos and videos to Samsung VR or to social media sites that support 360° photos/videos. Through the app you can manage the entire shooting experience from your phone. You can also change the view and settings and even add geotagging to your videos and photos. Don’t have the right smartphone? You can still use the camera. Everything is recorded to a micro SD card (up to 256GB). The controls on the camera, while simple, allow you to change shooting mode. It isn’t as convenient as using the app, but the camera is not useless without it. However, you do have to purchase a micro SD card separately. We highly recommend a card with U3 speed. While the 2017 Gear 360 model is an improvement over the early model and comparable cameras, it still falls short in a few ways. One of the biggest complaints from users is that the images and videos are not as clear as they expected. The 2017 model has two 8.4 megapixel (MP) lenses, whereas the the first generation Gear 360 camera had two 15 MP cameras. This reduction means the picture just isn’t quite as sharp, though this drawback is balanced out by the camera’s advantages, so it isn’t a dealbreaker for us. While the small handle certainly makes the Gear 360 easier to hold and use, it also means you will get part of your hand or fingers in the picture. This is simply part of using a 360° camera, but we recommend using a tripod or selfie stick whenever you can to avoid that. While the Gear 360 is great for outdoor adventures and exotic locations, it’s important to note that it is not an action camera meant for extreme sports or adventures, and it’s not waterproof. It has an IP rating of 53, making it dust- and splash-proof only. The biggest drawback to the Samsung Gear 360 is that in order to fully use all of its features, you need a Samsung Galaxy S6 phone or newer. The Gear 360 is compatible with iPhones now, but there are “functional limitations” with iOS devices, according to the Samsung website. In other words, some features are missing like livestreaming to social media. If you don’t have one of these phones, you can still use the camera, but you won’t be able to use a lot of the fun and exciting features. While a 360° view would be an excellent feature in a security camera, the Samsung Gear 360 is not meant to be one. Because it connects via Bluetooth, you’d have to be within about 30 feet of the camera to watch the video feed. Additionally, there is no night vision, no motion detection, and no alerts of any kind. On top of this, the camera and your phone would have to stay plugged in to avoid draining the batteries over an extended period of time. If you need a security camera, we recommend checking out one of Samsung’s security cameras or another high-definition security camera. I got to learn firsthand about the limited compatibility issues when I tried to download the Gear 360 app to my Samsung phone. I thought I would be okay with the latest version of Android installed, but because I have a J7 instead of an S7, the app was completely incompatible. It was especially frustrating as a Samsung user. Beyond that issue, every interaction I had with Samsung’s customer service was either good or great. Each chat representative was informative without being “salesy” and patient with the many questions I threw at them. There were a few delays in responses, but overall, I was quite pleased. On the phone, the customer service representative answered all my questions and was friendly without being pushy. Most impressively, I got a call back from that representative after hanging up because she realized she’d given me incorrect information and wanted to make sure I got the right info. Samsung is a large company with a lot of products, but I felt taken care of every time I reached out to them. Opinions from users about the Gear 360 camera are nearly split down the middle, with slightly more positive reviews than negative ones. Many positive reviews mention the price of the camera, the ease of use, and the quality of the finished products. Ironically, most of the negative reviews mention how disappointed the users were with the quality of the videos/photos. There were also repeated complaints about the camera not charging, pairing incorrectly, or overheating during a video transfer. A 360° camera certainly isn’t a necessity, nor is it for everyone. But if you are looking into getting one, the Samsung Gear 360 (2017) is a great option at a good price. The easy-to-use camera creates cool photos and videos, and with the app or PC software installed, you can get really creative with it. The biggest caveat is that you have to have a compatible smartphone in order to use the app, and many users were disappointed by the picture quality. Still, this is one of the best options for 360° cameras on the market right now. Do you have a 360° camera? 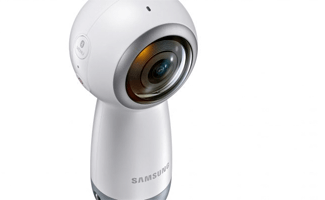 Have you tried the Samsung Gear 360? What do you love about it? Share your experience in the comments.